Cast your mind back to the first printer you saw or had and the chances are that it wasn’t the quietest! The Dot Matrix printers of old with the green and white striped pages, the ribbons that had to be kept to a certain tensile and the tear off punch holes to guide the reams through… Back then, it was amazing and ground breaking technology, but, now we have all-in-one printer units which are wireless, use lasers and are connected to the internet, so that you can print from anywhere in the world and also have scanners built in. Whilst these in themselves are awesome technological creations, there’s a relatively new kid on the block. Enter the 3D printer! A few years back, 3D printers entered the market with a whopping price tag, enough to make any keen tech lovers eyes water and credit card melt. These units would get people’s minds ticking over as to the endless possibilities. No longer would people be constrained to printing on paper, now people can print 3D objects out of plastic! “So what?”, some of you might say, and rightly so. When printers first came out, I remember messing about using clip art from various programs to just print out my name and a pretty picture. For most people, that is what a 3D printer might be to start off with, making some objects out of plastic and using stock images (3D renders) to create their own masterpiece. However, think bigger! What if you broke something in the house that you couldn’t do without? Would you have to buy it again? Would you be able to buy the individual part that you had broken? Chances are that you wouldn’t in this throw away day and age. If you’ve broken the battery draw on your remote, or a children’s toy then you’ll know of the frustration of having to buy the whole product again. Well fret not! 3D printers are here to save the day. 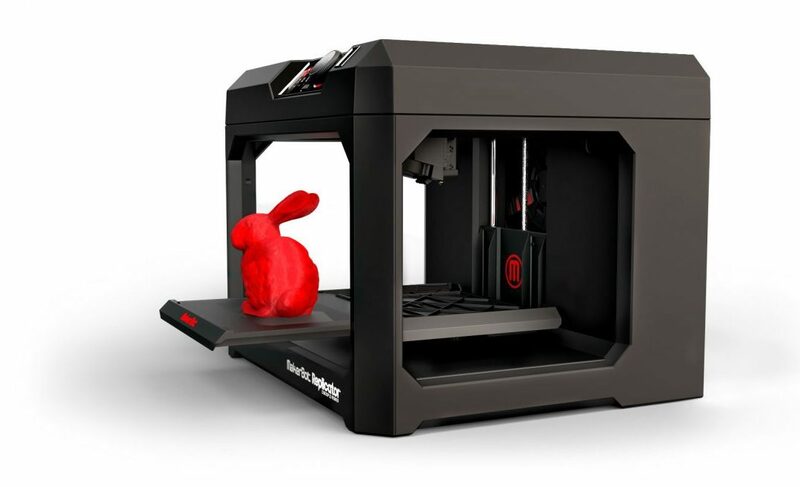 Using 3D scanners or 3D CAD software you can scan the item and then print out a brand new one using your 3D printer. Is the system perfect? Nowhere near yet. But with 3D repositories and manufacturers thinking to the future, there will come a time where if you break a part you can buy the 3D image from the manufacturer for you to print your replacement part at home! Seems like science fiction but, think as to how far printers have come over the past 20 years. The key to people adopting this technology more and more is ultimately cost and ease of use. If those 2 areas are overcome in the next 5-10 years, then having a 3D printer in the house will be just as common as having a kettle or coffee machine! Whilst it may look quite basic and can only make things out of 1 colour, this is a great entry point for people to have a play and learn how they work. Having these cheaper options are great to get people’s grey matter going and looking at what they can create. Starting off small and then creating more complex and innovative masterpieces. Repositories like Thingiverse, Pinshape and MiniFactory all have files that you can download for free or pay the creator for. From coat hooks, jewellery and secret shelves, to mini speaker housings and Frankenstein lever light switches. There are some awesome projects on there and it really shows the scope of what people can create, and if you are stuck for any inspiration you can browse through the pages on something to create. If these don’t inspire or impress you then I’ll leave you with the below that shows not only the practical implications of 3D printing but, also the life changing abilities of being able to make bespoke items without the huge costs involved. The world really is opening up to the inventor again!